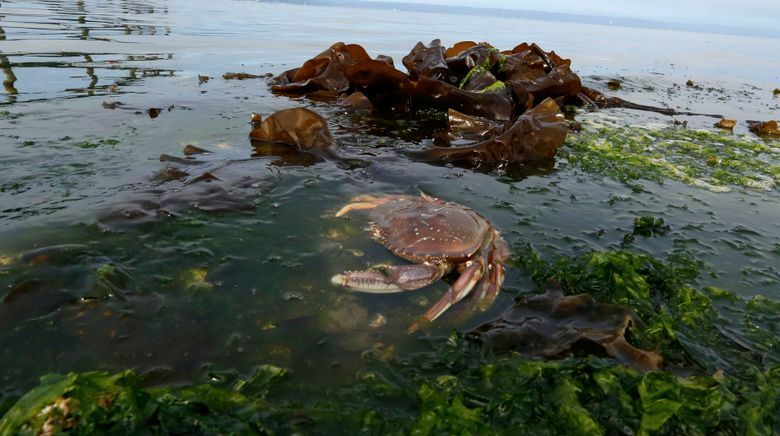 Dungeness crab are one of the species expected to be hit by the rising ocean acidity from fossil-fuel combustion, according to a new study. Dungeness crab are forecast to take a hit from ocean acidification driven by fossil- fuel combustion, according to a study released this past week. “We think that there will be a moderate decline in a species that is really economically important,” said Kaplan of the Dungeness, which were valued at some $220 million during the 2013 West Coast commercial season. The study published last week relied largely on computer modeling to forecast changes in the West Coast ocean ecosystem as acidity levels — during a peak summer period — are expected to increase by more than 50 percent. It is focused on offshore areas at least 98 feet deep. The study model indicates that the crab, which dwell along the seabottom, will suffer because of a decline in some of the species that nourish them. Some other bottom-dwelling commercial species, such as thornyhead rockfish and Petrale sole, also are expected to take a hit. But the computer model indicate that the pteropods, as well as copepods — another staple of many fish — won’t fare too badly. While some earlier studies have shown that increased ocean acidity can harm both of these species, the computer model did not indicate that they would be in serious decline off the West Coast during the next 50 years. Kristin Marshall, the lead author of the study, said copepods and pteropods benefit from great productivity, so even if some are harmed by acidity the computer model indicates that their overall populations would fare relatively well. “What stands out is that some groups you’d expect to do poorly don’t necessarily do so badly — that’s probably the most important take-away here,” said Marshall, who undertook the research at the University of Washington and at the federal Northwest Fisheries Science Center.